THE SPERRY DETECTOR CAR, when in service, moves over the track to be tested at a speed of five to nine miles an hour. When not engaged in detection, the car can do a speed of sixty miles an hour. The driving mechanism is a 220-hp Winton engine, coupled to a 700-volts generator. IT is no uncommon experience, when travelling to-day over an American railroad, to see in service what appears outwardly to be an ordinary rail-car, driven by an internal combustion engine, but attracting attention by its somewhat eccentric behaviour. High speed travel does not characterize its movements, which more closely resemble those of a tortoise. From time to time a splash of paint is seen to drop from the underside of the car-frame, and to leave its mark on one of the rails in the track. The car is searching for hidden defects in the rails, and its low speed is essential so that the electric current used for detection purposes may do its work, and reveal inside the rail-head that which no external scrutiny would ever find. When a defect has been found, its existence is marked on a moving paper roll inside the car, and the splash of paint dropped on the rail itself identifies the exact location of the trouble, and denotes where a very dangerous flaw may be found. The type of defect for which the car is searching is known as an “internal fissure”. In the chapter entitled “From Iron Ore to Steel Rail”, which begins on page 557, reference is made to the way in which the cooling of the rails after rolling at the mill is "evened out" in what is called a Sandberg oven, to prevent the setting up of undesirable stresses in the head of the rail at this critical stage in its manufacture. This method of retarded cooling was expressly devised to prevent the formation of internal fissures in the rail. If a rail cools out normally, in the open air, the outside skin during the cooling is obviously at a much lower temperature, by radiation, than the hot interior. If a curve be plotted showing the alteration in the physical properties of steel as its temperature is raised, it reveals that the steel becomes softer and more ductile as its temperature increases up to about 350 degrees Centigrade. It also shows that between 350 and 500 degrees the curve changes its direction, and a temporary increase of hardness takes place, until the 500-degree limit is passed. It is this zone, from 500 down to 350 degrees, that is the danger-zone in the cooling of rails. A TRANSVERSE FISSURE. The hidden defect that has occurred in the head of a rail. The hardness of steel is governed chiefly by the percentage of carbon it contains. The harder the steel, and the more rapid the rate of cooling, the greater are the stresses set up in the head of the rail while cooling through this zone. This is because the inside of the head is hotter than the outside. According to temperature, one part of the metal may be growing temporarily softer while the remainder is hardening. The internal strain may thus become so great that tiny fissures, usually at right angles to the length of the rail, are formed in the centre of the head, where they are invisible. Were these fissures to remain no greater in size than their original nucleus, there would be no danger. But the stresses set up in the rail by the passing of trains over it - flexure, pounding, and vibration - produce a gradual extension in the size of the fissure. Annularly, in the manner of the rings of a tree-trunk, the fissure grows from its small nucleus to a large and dangerous crack. At last there comes the occasion - perhaps as a result of a flat tyre or a locomotive out of balance - when the weakened rail breaks right through. Up to the moment of fracture there has been no external indication whatever that anything was wrong with it. In this respect the internal fissure differs from most other types of defect, which, although invisible at the time of manufacture, reveal themselves in various ways when the rails are in service. This gives the opportunity of removing and replacing defective rails before fracture occurs, which may prevent an accident. It was in America that fissure fractures first began to take place on an extensive scale. In countries where flat-bottomed rails are used, the risk entailed to trains by the breakage of a rail is considerably greater than in Great Britain. The standard British bull-head rail is so securely held under the head by the wooden keys that even if a rail breakage does occur, it is in the highest degree unlikely that a train will be derailed. But in America a number of disastrous derailments drew attention to the existence, in the heads of the broken rails that had caused them, of these curious round defects. These by their silvery-grey appearance, earned the name of “grey spots”. Analysis and microscopical examination of the rails concerned revealed the fact that no fault could be found with the steel itself. Attempts were made to ascertain whether fissured rails could be related to individual “heats” of steel; but, while some rails from any one heat were badly fissured, others were entirely free. Manufacturing methods came under review. The physical properties of different analyses were investigated; and endless statistics were compiled in an endeavour to get to the bottom of this metallurgical mystery. Meanwhile the fissure failures increased in frequency to an alarming extent until at length the trouble grew to the dimensions of a national menace. Indeed, up to the end of 1933 - the last year for which complete statistics are available - a total of no fewer than 74,405 fissured rails had been removed from American railroad tracks. It was a British firm of consulting engineers - Messrs. Sandberg - who, by patient research, finally proved that the fissured condition was brought about during the cooling of the rails through the range of temperature that has been already mentioned. 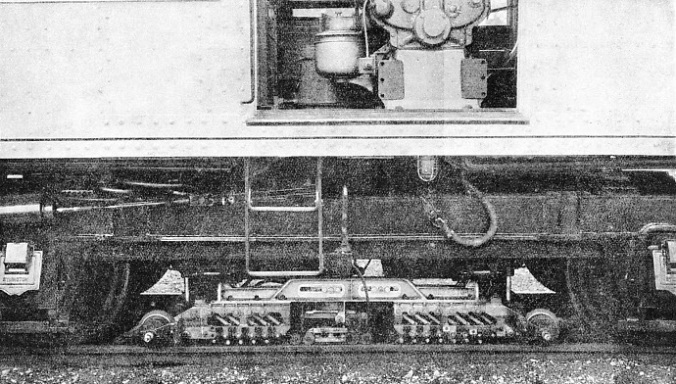 This firm devised the “oven” for the purpose of keeping the whole of the rail at a perfectly even temperature during the critical stage of the cooling. The rails enter the oven at one side, broadside on, and by means of skids are slowly moved through the oven to the other side, keeping it at the correct temperature by their own heat. It has been proved practically beyond doubt that this retarded cooling does minimize, if it does not entirely abolish, the risk of fissuring. Certain American steelworks have, therefore, adopted the oven method of cooling the rails as their standard practice. Others have instituted similar measures, such as packing the hot rails into brick-lined boxes of large size until they have cooled out. In Britain, oven-cooling is applied to the majority of the rails supplied to British railways, and to many exported rails also. THE RECORDING OPERATOR watches the track from the rear of the moving car. On the table before him is a paper strip, which moves at a speed proportional to that of the car, and on which is marked in ink a continuous record of the condition of both rails of the track. Twenty-five different instruments are within range of the operator’s vision. The rack of rubber stamps on his right is used for the marking of the roll. The defects are clearly indicated on the roll by distinctive marks denoting the location and extent of the fault. But although internal fissures are not unknown in British rails, the fissuring trouble here has up till now been more or less negligible. The reasons for this difference, as compared with what has happened on American railways, are several. In America the vastly increasing weight of locomotives and rolling-stock, with axle loads up to thirty tons and more, has made it necessary not only to use bigger rail sections - weighing as much as 152 lb per yard on the Pennsylvania main lines - but also to stiffen the rails by making them harder. Carbon percentages have been forced up to what would in Great Britain be regarded as dangerously high figures, so that a type of steel has been produced that is far more liable to fissuring than rails made to British standard analyses. Add to this the great extremes of temperature on the North American Continent, and especially the below-zero temperature of the winter, which accelerate the cooling-out of the rails, and two predisposing causes of fissures have been brought together. Then, if the fissure is present in the rail, the heavy American axle-loads, and the excessive “hammer-blow” which cannot be avoided with two-cylinder engines having cylinders of the immense dimensions common in America, are just the conditions that will rapidly enlarge the fissure to dangerous dimensions and so cause the breakages. When it was discovered that these internal flaws, which were taking a terrible toll of material and of human life, as a result of rail breakages, were all of one common type, drastic measures were taken by American railroad companies. If more than three rails out of any one “heat”, or cast of steel, failed by reason of fissures, the whole of the rails from that heat were removed from the track, even though from 60 to 100 tons of rails were thus involved. But this has since been proved not only to be a wasteful method, but also unnecessary, as the fissure trouble lies entirely in individual rails rather than in groups, though certainly it is most prevalent in “heats” which contain the highest carbon percentages. The cause of the trouble has now been more or less definitely determined, so that fissuring can be reduced, if not entirely obviated, in future. There are, however, in American tracks, rolled during the last decade or two, tens of thousands of rails in the heads of which fissures are probably in course of development from their original nuclei. Each one of those fissures is a potential danger, and it is of the greatest importance that they shall all, if possible, be discovered and removed from the track in time. It was the late Dr. Elmer A. Sperry, a well-known American inventor, responsible for such important devices as the gyro-compass and the ship stabilizer, who perfected the means of fissure detection that is known and used throughout the length and breadth of North America. His method has been introduced into France as well. A fleet of Sperry detector cars is now in constant operation in North America and Canada over all the principal main lines. After more than five years of research, during which other scientists were at work on this formidable problem, but without practical result. Dr. Sperry discovered the principle he sought. It was that of passing through a rail a low-voltage electric current of about 2,000 amperes, which set up a magnetic field about the rail-head. Whenever an internal fissure was encountered the effect was to change the axis of the magnetic field, and to distort the flux. By passing a coil along above the rail, Dr. Sperry found that he could pick up this momentary distortion and, with proper amplification, could cause it to operate a recording pen. 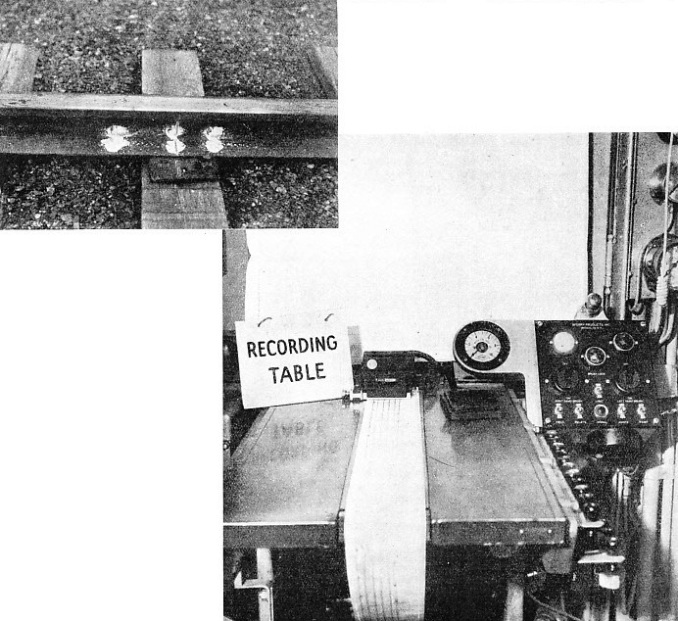 The next step was the simultaneous operation of a paint-gun, so that both a recording roll of paper in the detector vehicle and the affected part of the fissured rail could be marked at the same time. By 1928 the first primitive Sperry car was ready to give a demonstration on the railroads. It located a certain number of fissures, and when the rails concerned were broken at the point where they had been marked with paint, fissures were found to be present. 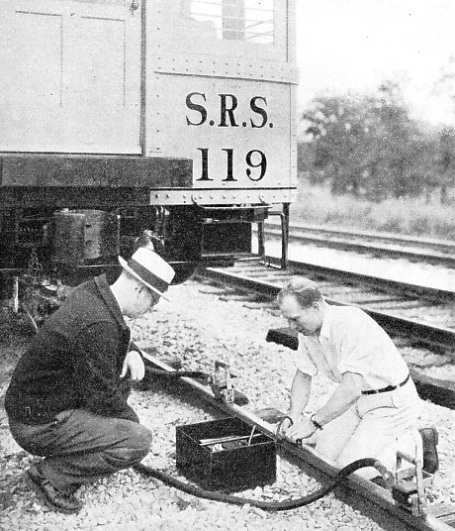 With faith in the future of their discovery, the Sperry Company began to build their first fleet of detector cars, but Dr. Sperry himself died before construction was complete. The principle of detection was thus firmly established, though the method of working it out was as yet far from perfect. Sometimes a fissure would break a rail through shortly after one of the Sperry cars had been on one of its exploratory journeys over that particular track, and without leaving any paint-mark on that rail. It might have been that some fractures sprang suddenly from small nuclei to dangerous size overnight, but it was more likely that the system of detection was still far from fool-proof. The next step was to lay down a special test track of rails that were known to contain fissures. Twenty-eight fissured rails were assembled to form a most curious stretch of permanent way, and one of the cars was run over it. The result was astonishing. If the rails were energized by the current in one direction, from positive to negative, then the car, when running in the opposite direction, missed half the fissures. But if the car made a second trip in the latter direction, then all the fissures were detected at full strength. These tests led to the conclusion that each face of a transverse fissure constitutes a definite pole. If the polarity were alined in the same direction as that of the testing, fissures could easily be detected, even down to those of comparatively small size. But if the polarity were opposed to the direction of testing, then it was difficult, if not impossible, to detect any fissuring. New equipment was therefore devised to “pre-energize” the rail before the searching unit passed over it; that is, to give it a “jolt” of electricity before the energizing of the searching unit passed over it, and so to aline the polarity throughout. As compared with the previous method, therefore, the present method of detection used on Sperry cars is equivalent, in its electrical effect, to a double trip over the track of one of the earlier cars. 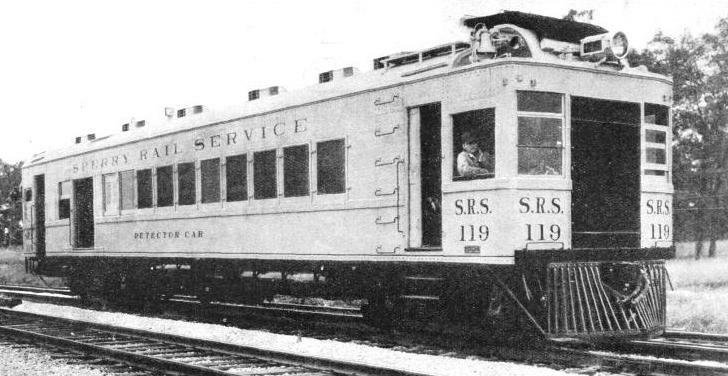 A modern Sperry detector car is a self-propelling unit containing living and sleeping accommodation for the crew, as these cars make lengthy runs which may take them away from their base depot for considerable periods at a time. The latest cars are 57 ft 4 in long and 9 ft 10 in wide, and weigh just over fifty-six tons in running trim. For driving the car, a Winton petrol engine is fitted, having a rated output of 220 horse-power at 1,050 revolutions per minute; and this is direct-coupled to a 700-volt generator, the final drive being electric. A speed of sixty miles an hour has been attained by one of these cars, but normally a limit of forty miles an hour is imposed Such running, however, takes place only to and from the scene of operations. Once detection has begun the car is slowed down to a speed varying between five and nine miles an hour. The car is equipped with compressed air brakes which make it possible to stop in a few yards when travelling at this speed. The car is operated partly by a controller having five steps - one each for operating the compressor, neutral, motors in series, motors in parallel and shunt field position - and, after this has been set, the entire movement is handled by the throttle, which increases the speed of the engine. At the front end of the car is the combination driver's cab and engine compartment. Behind this comes the galley, with cooking stove and refrigerator, and after that a lounge and dining-room for the staff. In the centre of the car is located their four-berth sleeping compartment, shower-bath room, and lavatory. Radio is installed for the entertainment of the staff in the evenings, when the car is shunted into some out-of-the-way siding for the night. THE ENGINE ROOM in which the current is generated for the work of detection. A current of 7,000 amps is delivered to the main detector brush carriage. 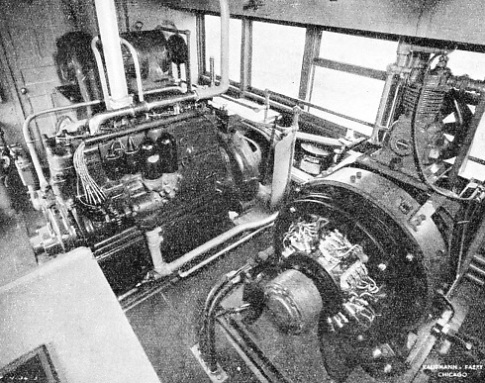 Towards the rear of the car is the large room housing the generating equipment for the detectors (which is quite distinct from the driving equipment), paint - tank, air compressor, auxiliary lighting unit, panel boxes for the detector control wiring, storage cabinets for tools, and work bench. The generating set comprises a 150 horse-power petrol engine driving three generators and the air-compressor by “V” belts. Radiators for the engine are built into the car roof, and, to provide suction, a fan is fitted, having a capacity of 15,000 cubic ft a minute, driven by a 110-volt direct current motor of five horse-power. Current for the main detector brush carriage is delivered at 7,000 amperes by a 3-volt generator, which has an overload capacity up to 10,000 amperes. The pre-energizing current is produced at 6 volts in a generator rated at 3,000 amperes, and with an overload capacity up to 5,000 amperes. At the rear end of the generating compartment there are located water tanks of 500 gallons capacity, built in the form of an archway over the communicating door to conserve space. Water is used to clean the rails when detection is proceeding, as this improves the contact of the brushes, and enables the detection equipment to function at a lower voltage. At the rear end of the car is the recording compartment, containing the “brains” of the equipment. Here the recorder sits, with a clear view of the track as it slowly disappears from behind the car. Immediately before him is the recording table, over which an endless band of paper is moving at a speed so adjusted that each 1/16-in of paper represents one foot of rail. Seven parallel lines are seen on the paper, on certain of which momentary notches are seen. The right-hand line is used for identification purposes, being “notched” by a manually-operated control every time a mile-post, section-post, or other landmark is passed. Line No. 2 is the one which the left searching unit notches automatically as it passes over a defect in the left-hand rail. Line No. 3 notches the position of each rail-joint, so that each defect can thus be readily located from the diagram. Lines 4 and 5 are used to give a visual check on the electric current that is being passed through each rail, so that the operator sees at all times if the testing apparatus is functioning properly. Lines 6 and 7 are used to indicate respectively the rail-joints and defects in the right-hand rail. The searching units themselves are mounted in the centre of the rear end bogie truck of the car, on either side, being lowered on to the rail when detection is in progress, and lifted out of action when the car is travelling to and from its work. They are raised and lowered by pneumatic power. The searching unit consists of multi-tandem pick-up coils, flexibly mounted, so as to maintain perfect contact with the rail. Between the two sets of brushes is the electrical apparatus used to measure the distortion of the flux. So sensitive is the searching unit that it will locate a fissure no greater in extent than five per cent of the cross-sectional area of the rail-head. Other descriptions of rail defects also advertise their presence on the paper roll. 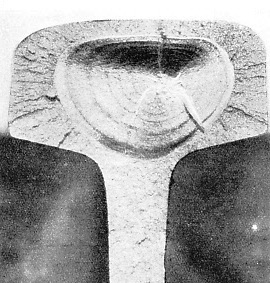 They include “piping” (a bubble of gas which has been imprisoned in an ingot during cooling from its molten condition, and in rolling has elongated to a longitudinal fissure in the lower part of the rail-head or in the web), damage to the running surface of the rail by skidding (known as rail burns), split heads, laminations, and so on. Even such minor troubles as the “flowing”, or gradual spread of the rail-head under traffic, do not escape attention. But with further improvements in the methods of searching, the apparatus is being modified so that minor defects are having less effect, and the searching is thus being made to concentrate more and more on fissures only. Directly one of the defect lines on the roll has been notched by a searching unit, the operator is alert. First he looks at the rail to see, as it appears from below the car, if the paint-gun has splashed it. If he can see from the car that the flaw is only of a surface description, he marks the roll accordingly, and the car proceeds. But if there is no outward cause, he signals to the driver to stop, and alights. Taking with him a hand-testing apparatus of a still more sensitive description, he tests the affected rail electrically, confirms whether or not a fissure exists, and, if it does, the exact area of the defect. If it is small, the roll is marked with the percentage size of the defect, with a view to checking the growth on the next test run. If it is dangerously large, emergency orders are issued for the immediate replacement of the affected rail. THE CONFIRMATORY HAND TEST. When the recording chart shows a defect, the car is stopped and a confirmatory hand test is conducted. This second test indicates conclusively the exact nature of the flaw, its extent and location. If there is a serious defect, emergency orders are issued and the affected rail is replaced immediately. Ready to the operator’s hand in the car are two dozen rubber stamps, in two racks, which are used for the marking of the roll, to number the fissures and record their size, to identify switches and crossings, to indicate mile posts and section posts, and for various other purposes. At the completion of the run, therefore, the diagram presents a continuous picture of the whole of the rails in the track over which the car has travelled. 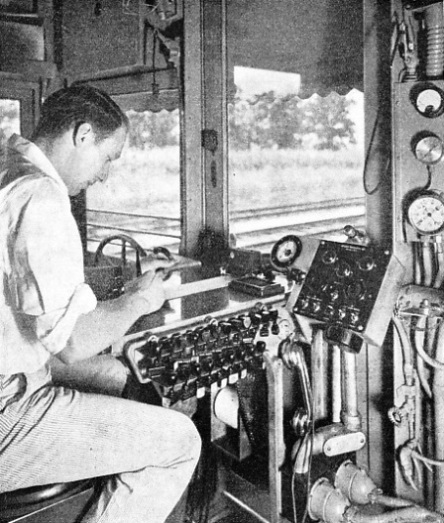 There are in all twenty-five different instruments within the operator's view, indicating to him how the various units are functioning while the test is in progress. At this end of the car throttle and air-brake controls, with voltmeter and oil-pressure gauge for the driving engine unit, are fitted for the backwards operation of the car, over long distances when necessary. In this remarkable vehicle nine different voltages are used, ranging from 1 to 700, for the detector equipment, lights, and drive. Eighteen different electrical machines, either generators or motors, are in constant use, and thirty-eight meters. For the electrical wiring 500 ft of conduit have been used, and 200 ft of air piping are also installed. For the detector equipment and control wiring 5,706 ft of wire have been needed. In a typical month a Sperry car has covered 396 track miles, averaging fourteen miles a day, and as a result 195 rails have been removed from the track because of the presence of fissures. No two days’ work are alike. One record obtained showed an average of no more than one fissure per 11.8 miles of track; another revealed sixty-nine fissures in three days, of which thirty-three were detected in less than one mile of line. The number of rails removed from American tracks because of fissure trouble has gradually grown to over nine thousand per annum. Many of these, on subsidiary lines in particular, have revealed themselves by the breaking of the rails concerned. But the day has at last come when the number detected by Sperry cars, and removed before breakage occurs, regularly exceeds the number discovered in other and often disastrous ways. The average is slightly over twenty fissures detected per hundred miles of track tested. What the transverse fissure defect has meant to American railroads in cost of rail replacements, and compensation for injuries and loss of life, is better imagined than calculated. But the safeguard of Sperry detection now appears at least to have eliminated from this heavy bill the cost of railway accidents. One railway over which a car had operated took the trouble to break each rail at the point indicated by the paint splash, and in 143 instances out of 144 a fissure was found to be present. The question may be asked as to why the detection cannot be done at the steelworks or at the railway rail storage depot, before the rails are laid in the road. But the answer is that in their initial stage these sub-molecular cracks are generally so minute that no apparatus could detect them. It is not until running over the rails has begun that the fissure begins gradually to increase in size, until it is sufficiently large to be detected. For this reason the Sperry cars continue to patrol the same tracks at regular intervals, checking each fresh record against those previously made. THE SEARCHING UNIT seen in the lowered position in contact with the rail. To the left and right are the flexibly-mounted brushes, through which the heavy low-voltage current is passed to the rail, and in the middle is the apparatus for measuring flux distortion. THE PAINT SPLASHES are automatically dropped on an affected rail when the searching unit discovers defects. THE RECORDING TABLE. The paper band on which the recording is done by seven pens moves at a rate equivalent to 1/16-in. Of paper to every foot of rail. At the back of the table is a speed indicator.